Reading Transport Wright Solars: 1010-2 were in fact delivered with the correct registrations, making it three swaps since their arrival! The first swap came before entry into service - the road fund licenses were allocated in body number order, which is out of sequence with the chassis numbers. The difference was spotted, and the registration plates were swapped to match the incorrect licenses before they went on the road. Stagecoach in Oxfordshire and Warwickshire Fleet List: 14516 has transferred from Leamington to Rugby along with some parts of a Leamington duty. 50046 and 50058 arrived in Oxford yesterday on loan from Stagecoach Bluebird for the Oxford Tube. 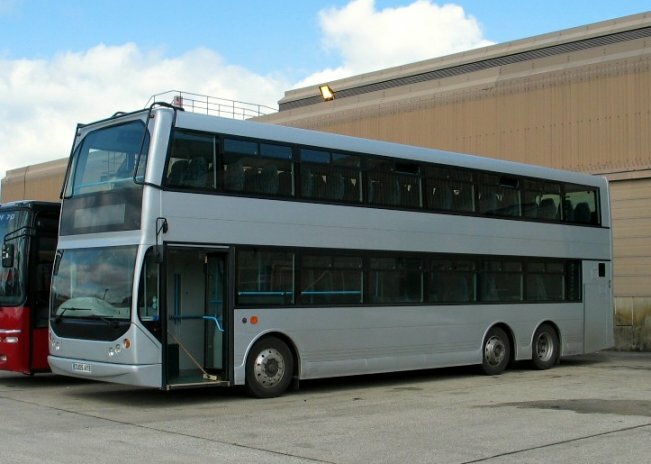 A further two are also expected shortly, and will provide cover for 6-8 weeks whilst the Neoplan Skyliners go away for warranty work. Stagecoach in Oxfordshire and Warwickshire Fleet List: Withdrawn 14375 and 14377 are in store at Nuneaton. Thanks to Keith Wood for this. First Berkshire Fleet List: 42416 has been repainted into First livery, ex Borough Bus Airoute Link livery. 64819 has a new MegaRear for the Oracle. Thanks to Stephen Le-Bras for this. Stagecoach in Oxfordshire and Warwickshire Fleet List: Leamington 13615/25 have been put into reserve following the arrival of the two new Neoplans. Weavaway Travel: New photos of OU05 AVB and a row of six Noah Vale vehicles added. Thanks to Malcolm Crowe for these photos. Reading Transport Fleet List: The registrations of 1010, 1011 and 1012 have been swapped around twice since their arrival! On the first day 7th March they were GXL, GXM and GXO as reported on this site. However what doesn't seem to have been noted until now is that by 12th March they had become GXO, GXL and GXM, and between 4th and 11th April they became GXM, GXO, GXL!! The registration plates now correctly run in chassis number order as reserved by Scania, whilst the fleet numbers run in body number order - this is also the reason why the registrations on 1003 and 1004 are out of sequence. 808's rear is 'our route to the shops' rather than 'my route'. 927 has a new MegaRear for The Oracle (Two Ladies Shopping). Reading Transport Wright Solars: 1001, 1011 were delivered on 1st March and 1012 on 4th March. 1013-20 are now expected on weeks commencing 6th - 27th June in batches of two per week. Weavaway Travel Fleet List: The fifth B9TL arrived on 22nd and is OU05 KKB. Thanks to Derek Bradfield for this. Stagecoach in Oxfordshire and Warwickshire Fleet List: 32704-6 are to be returned from Carlisle to Banbury for a few weeks as contractual changes in June mean that two extra buses will be required. They will depart again when new vehicles arrive as part of two new kick start schemes. Weavaway Travel Fleet List: B10 MKF is named Ark the 'erald Angel, and the two Metrobuses are also in Noah Vale livery. Thanks to Malcolm Crowe for this. Stagecoach in Oxfordshire and Warwickshire Fleet List: New at Leamington are Neoplan Skyliners 50141/2 for the Megabus service to Birmingham. 50141 is KX05 HVE and 50142 is KX05 HVF. Thanks to Dave Balme and Suzy Scott for this. 50142 is in place of 50140 which was originally to be allocated to Leamington. Stagecoach in Oxfordshire and Warwickshire Fleet List: Nuneaton 14386 lost its MegaRear for Coventry City Centre Shopping when in was repainted into new livery a good while ago. Banbury 31852 has a new half MegaRear for 'Tile R Us'. Thanks to Keith Wood for this. Weavaway Travel Fleet List: Two more of the B9TLs to arrive are OU05 AVY and OU05 AWJ. W11 WAY has been reregistered W197 EJO. Thanks to Derek Bradfield for this. Reading Transport Fleet List: 474 has a new MegaRear for directline.com. 471/2's were applied on 11th April and 474 on 12th. Thanks to Brian Coney for this. Reading Transport Fleet List: 473 has a new MegaRear for directline.com. Thanks to Jon Nutt for this. Reading Transport Fleet List: 471 and 472 have new MegaRears for directline.com. Thanks to Jon Nutt for this. 928 has a new rear for The Oracle (Two Ladies Shopping). First Berkshire Fleet List: 42415 has been repainted into First livery, ex Borough Bus Airoute Link livery. All others in this livery are also to be repainted soon. Thanks to Stephen Le-Bras for this. Stagecoach in Oxfordshire and Warwickshire Fleet List: 40159 has lost its MegaRear for the Rugby Town Centre Company. Thanks to Keith Wood for this. 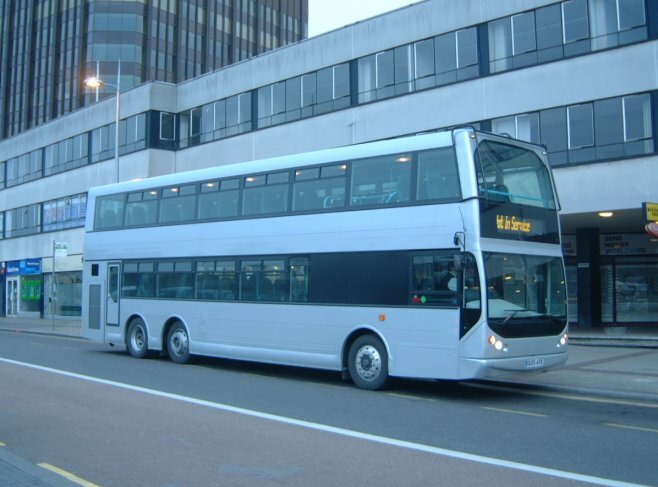 Reading Transport Fleet List: 107 and 108 have new MegaRears for the Oracle (design tbc). Thanks to Michael Todd for this. An unidentified Reading Excel also appeared by 5th April with a new rear for the Oracle. Reading Transport Fleet List: The rear of 815 remains blank, so the "new hair do" rear may be on 811 or 816. Thanks to Jon Nutt for this. Weavaway Travel Fleet List: A second B9TL now here is OU05 AVD. Thanks to Derek Bradfield for this. The new owner of Optare Solos YN03 NCF/NEF is MK Metro. Reading Transport Fleet List: 810 has received additional rear lettering for 'My route to study', 813 for "My route to the gym" and 812 for "My route in the morning". Also 809 is "Our route to see the grandchildren", not "My route...". 811, 815, 816 have been recorded recently as remaining blank, although 815 may now have "my route to a new hair do" added. Weavaway Travel Fleet List: The new Volvo B9 / East Lancs tri-axle vehicles are now being delivered. Noted in service so far has been OU05 AVB. Thanks to James Cusworth for this. Reading Transport Fleet List: 809 has received additional rear lettering for 'My route to see the grandchildren'. Thanks to Derek Bradfield for this. Reading Transport Fleet List: 812 has received additional rear lettering for 'My route to a date'. Thanks to Jon Nutt for this. Stagecoach in Oxfordshire and Warwickshire Fleet List: 14369, 14373, 14375, 14377 and 14378 have been withdrawn for disposal from Leamington along with 14942 and 14943 from Rugby following school contract losses. 40142 has also been withdrawn from Leamington, whilst 20401 and 20402 have gone into reserve. 20823 has gone away for refurbishment. Reading Transport Fleet List: 817 has received additional rear lettering for 'My route home'. 809 also has my route to somewhere lettering. Thanks to Derek Bradfield for this. Weavaway Travel Fleet List: Bova registrations corrected to WA05 DFG/J (not FDY). Optare Solos YN03 NCF/NEF have now been sold and left the fleet today. Thanks to Derek Bradfield for this. Stagecoach in Oxfordshire and Warwickshire Fleet List: Couple of typos corrected. Thanks to Mike Lane for this. 20220 has a new MegaRear for Holdsworth Personnel in place of its Birmingham Bull Ring one. Thanks to Keith Wood for this. Reading Transport Fleet List: 807 has received additional rear lettering for 'My route to a new job' and 808 for 'My route to the shops'. Thanks to Derek Bradfield for this. Weavaway Travel Fleet List: The second new Bova is WA05 DFJ. Thanks to Derek Bradfield for this. Weavaway Travel Fleet List: New is Bova Futura WA05 FDY in plain white, along with one other. B10 MBD is in yellow Noah Vale livery and named Ark De Triomphe. All of the Condors are thought to be in yellow and named with names starting with Ark. The vehicles parked up in Caversham appear to have been subject to graffiti attacks, including B10 MBD.